Based on popular culture and the power of images, Pop Art reached its peak in the 1960’s and has never gone out of style. 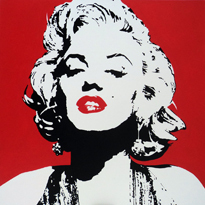 Make a statement on your wall with a dynamic artwork, depicting iconic celebrities such as Marilyn Monroe, James Dean and Audrey Hepburn. Stay tuned for designs coming soon.